This fourth edition has been totally revised and updated with many additions and major changes. The material has been reorganized to match better the sequence of topics typically covered in an undergraduate course on kinematics. Text includes the use of iterative methods for linkage position analysis and matrix methods for force analysis. BASIC-language computer programs have been added throughout the book to demonstrate the simplicity and power of computer methods. All BASIC programs listed in the text have also been coded in FORTRAN. Major revisions in this edition include: a new section on mobility; updated section on constant-velocity joints; advanced methods of cam-motion specification; latest AGMA standards for U.S. and metric gears; a new section on methods of force analysis; new section on tasks of kinematic synthesis; and a new chapter covering spatial mechanisms and robotics. Hamilton H. Mabie, Professor of Mechanical Engineering at Virginia Polytechnic Institute and State University since 1964, received his B.S degree form the University of Rochester, his M.S. degree from Cornell University, and his Ph.D. degree from Pennsylvania State University. From 1941 to 1960, Dr. Mabie was on the faculty of the Sibley School of Mechanical Engineering at Cornell University. From 1960 to 1964, he worked at Sandia Laboratory in Albuquerque, New Mexico, where he was engaged in research and development related to nuclear weapons. In addition to his work in kinematics, Dr. Mabie is engaged in research on gears, torque characteristics of instrument ball bearings, environmental effects on the fatigue life of aluminum, and fretting corrosion of rolling element bearings. He has authored and coauthored many technical papers in theses fields. He is a licensed professional engineer and a Life Fellow of the Ame4rican Society of Mechanical Engineers. 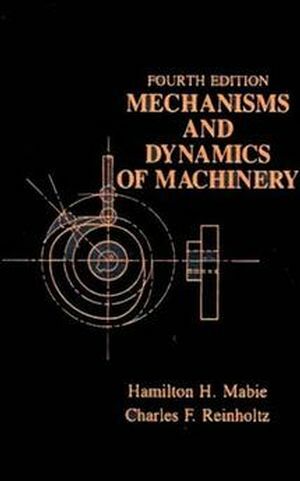 The first edition of Mechanisms and Dynamics of Machinery was published by John Wiley & Sons in 1957 and the second in 1963, both with the late F. W. Ocvirk as coauthor. The third edition was published in 1975 and an SI Version in 1978. This fourth edition has Charles F. Reinholtz as coauthor. Charles F. Reinholtz is currently Assistant Professor of Mechanical Engineering at Virginia Polytechnic Institute and State University in Blacksburg, Virginia, a position he has held since 1983. He holds B.S., M.S., and Ph.D. degrees from the University of Florida. He also worked for Burroughs Corporation as a design engineer in the Peripheral Products Group. Professor Reinholtz has been active in the area of Kinematics and mechanism design since 1976. He is a member of The American Society of Mechanical Engineers, The American Society for Engineering Education, and Sigma Xi. He is also a member of Tau Beta Pi and Pi Tau Sigma Honor Societies. Chapter 2. Linkages and Mechanisms. Chapter 5. Nonstandard Spur Gears. Chapter 6. Bevel, Helical, and Worm Gearing. Chapter 8. Velocity and Acceleration Analysis. Chapter 9. Force Analysis of Machinery. Chapter 10. Balance of Machinery. Chapter 11. Introduction to Synthesis. Chapter 12. Spatial Mechanisms and Robotics.